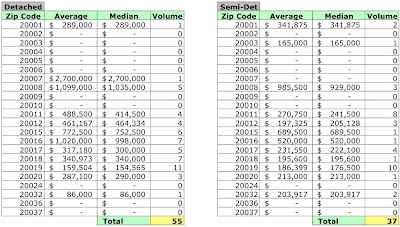 I've completed my analysis of February 2009 sales of homes and condos, as recorded by the District. 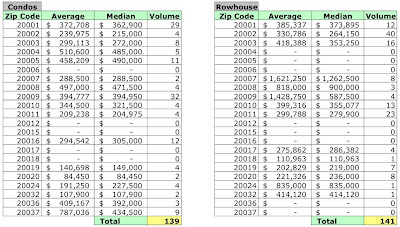 The table below shows February 2009 average and median sales prices and unit volume by zip code and the percentage change from February 2008. Foreclosures were still a significant portion of the "sales" recorded in February, 72 of 372, 0r 19.35%. 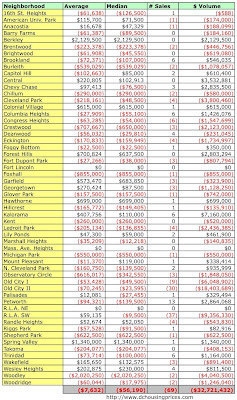 Deutsche Bank is really taking it on the chin; they "bought" 19 of those 72 properties. 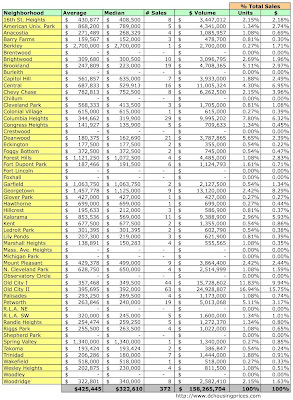 The following table shows the change in prices and sales volume for each District neighborhood; few were in the black for the month. YoY, dollar volume fell by $32.7MM and 69 fewer units sold. 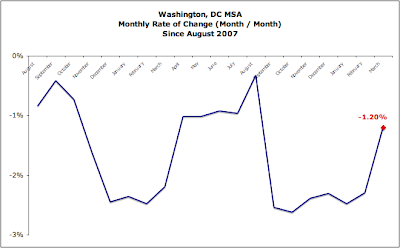 In February the District recorded 372 residential sales. 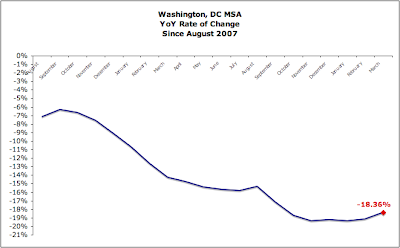 The average sales price fell 1.76% and the median sales price fell 14.83%. 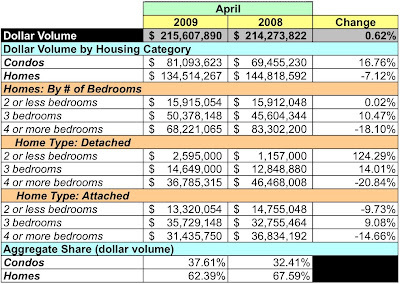 The condo market was clobbered: unit sales were down 41.84% YoY and dollar volume tumbled 40.24%. 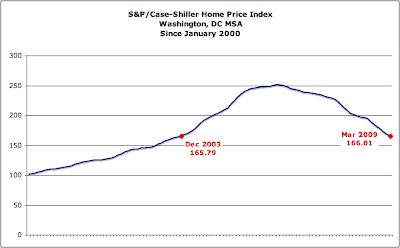 The number of homes sold grew 2.38% and dollar volume was similarly positive, up 2.71%. 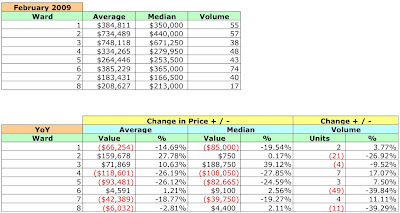 Average and median sales prices for homes were flat to negative, up 0.32% and down 14.77%, respectively. 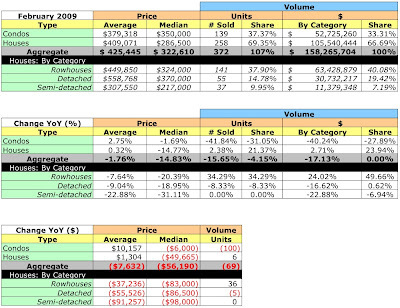 Wards 2, 3, and 6 had a positive month, experiencing price increases despite a precipitous fall in unit volume. Condo sales ruled Wards 1 and 2, constituting 52.73% and 78.95% of units sold, respectively. 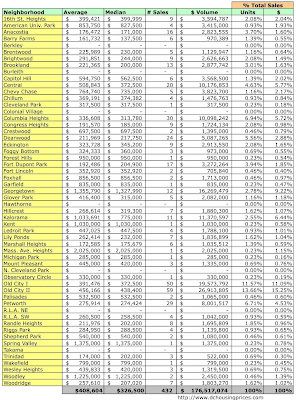 Sales prices were 91.15% of list, about the same as March. 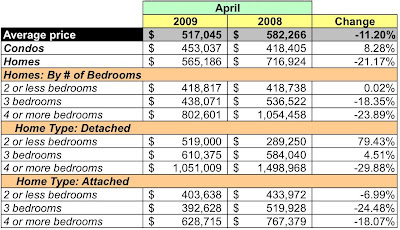 At April's sales rate, the condo market has a 9.9 month supply listed for sale, a 10% slip from March. I've completed processing District sales for February 2009. As a first step, sales by neighborhood are displayed below. Old City II had the largest share of units sold that month, 16.94% of all unit sold in the District that month, and ditto dollar volume, 15.75%. I'm utterly swamped at work and at home; a short non-swine flu illness hasn't helped, either. 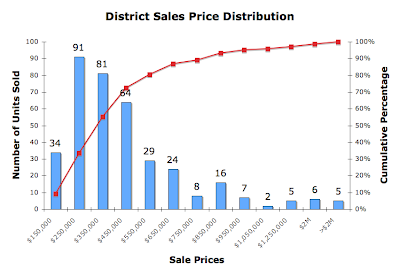 In my spare moments, I've completed the analysis of District sales for February 2009 and will post it when I get a chance.